UConn, VCU, Kentucky, Butler. I read on ESPN all the crazy stats about people that actually had the correct Final Four. Out of the 5.9 million ESPN.com’s Tournament Challenge, only 2 of these clowns got them correct. Who the hell do these jerks think they are? They deserve junk punches anytime/anywhere from Livan Hernandez free of charge. Butler and VCU in the Final Four? You say that three weeks ago… and people are mocking you as if you’ve never even watched a game of basketball before. Meet “JSPEARLMAN”, the current leader of the ESPN Bracket Challenge. 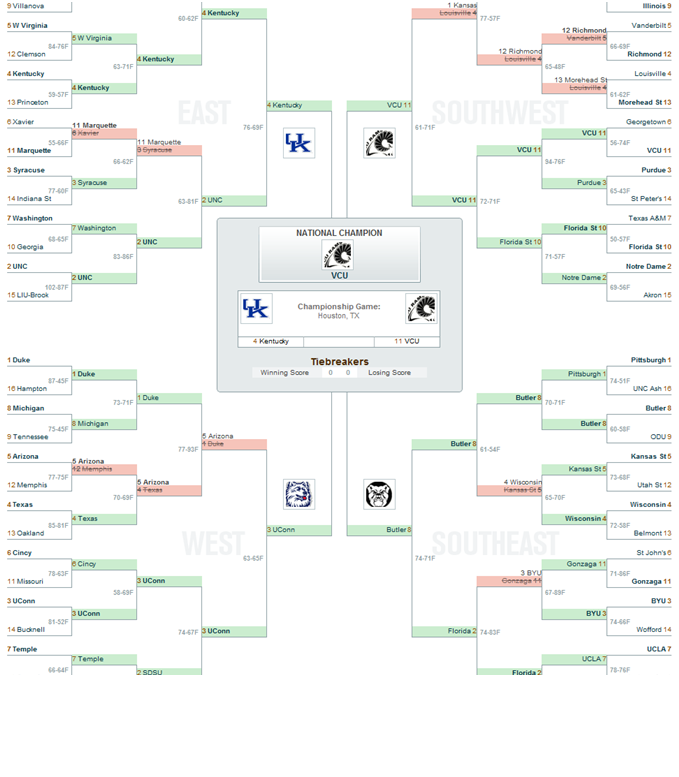 Here’s his bracket. Dude’s got over 600 comments on his ESPN SportsNation page talking about lucky he is. He writes, “I can’t believe my luck – this is my only bracket. what great comments!” Who’s this guy think he is…picking Gonzaga to beat BYU? What a jerk. This entry was posted in Basketball, March Madness, NCAABB and tagged Butler, Butler and VCU in the Final Four, ESPN.com's Tournament Challenge, Final Four, JSPEARLMAN, Kentucky, UConn, VCU. Bookmark the permalink.